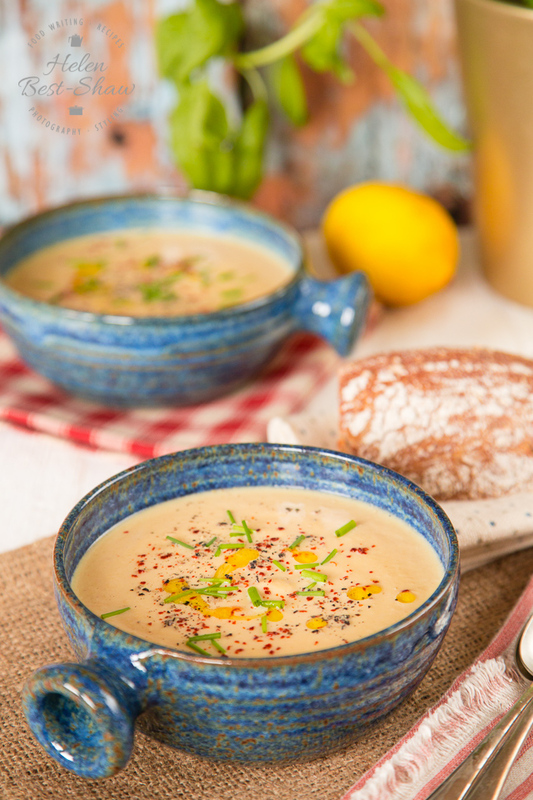 This fragrant golden soup is a perfect recipe for spring; butternut squash soup with lemon and tahini. Light and delicious. 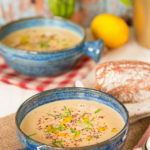 This butternut squash soup with lemon and tahini is brightly flavoured and has a velvety soft texture. It is ideal for those cold days of spring. Here in London the weather really cannot make its mind up – blue skies and sun one moment, then suddenly clouds, wind, snow or hail. It is also really not very warm at all, I am sitting at my desk typing layered in both a fleece and a sweater as well as fingerless gloves. Usually by this time of year we would have taken the electric blanket off the bed, packed away some woolly sweaters and be eating lighter food. My butternut squash would be roasted and served with a tahini and lemon dressing, rather than packing all the flavours into a bowl of soup! I love butternut squash and add one to my basket with every shop. Butternuts are really quite good for you; fat free, high in fibre, low GI, low in calories and are packed with beta catotene, vitamin C and the minerals selenium, zinc, manganese, magnesium and potassium. As well as being good for you butternut squash are versatile; they can be baked, roasted, boiled, spiralized, puréed or fried, gently toasted the seeds are delicious. I often keep a tub of roasted squash in the fridge of freezer to use in salads, stir fries, even smoothies and fritattas. 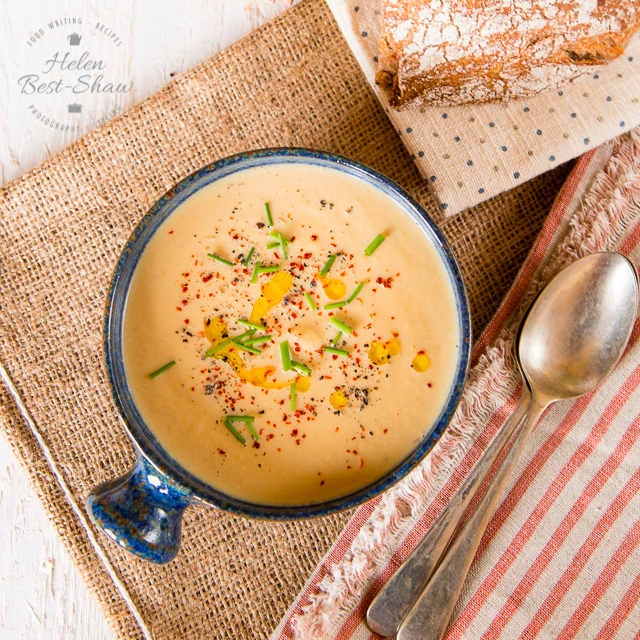 For this soup I baked the butternut squash to concentrate and sweeten the flavour, the tahini adds a depth and a velvet smoothness and the lemon lifts the soup and reminds me that it is supposed to be summer! If you like spices I think that some cumin, allspice or chilli would work well, but the three simple flavours used all combine to make a rounded whole, packed with layers of taste that really need no extra flavouring. If you try this Butternut Squash, Tahini & Lemon Soup please tag #FussFreeFlavours on Instagram or Twitter. It is amazing for me when for me when you make one of my recipes and I really do love to see them. You can also share it on my Facebook page. Please pin this recipe to Pinterest too! Thanks for reading Fuss Free Flavours! Cut the butternut squash in half lengthways, scoop out the seeds, and bake at GM4/180C/350F for about 30 mins until soft. No need for a tray, just put the squash cut side up on the oven shelf. Meanwhile peel and roughly chop the onion and garlic and sweat in the olive oil in a deep pan until translucent and starting to turn golden brown. Remove the squash from the oven and discard the skin. Add to the pan along with the other ingredients. Simmer for 5 mins, and blend either with a food processor or with a stick blender. Serve piping hot, garnished with some green herbs.